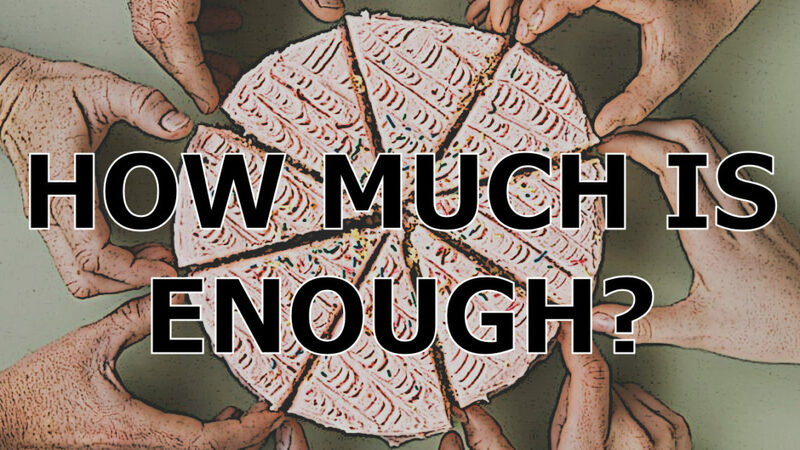 » How Much is Enough? — Paul’s argument for collecting money for the Jerusalem church is that proper balance should exist within the Kingdom of God. Often, we feel like everyone and everything including the church is grabbing for money. It triggers guilt in us. But if we understand how much is enough for us, we can approach giving in a way that both pleases God and Gives us life! – This is especially pointed since GA just raised per capita! We just celebrated the 4th of July! It can be fun to spend time with family, blow up some fireworks, and celebrate our country. Did you do any of those things this week? It is nice to recognize the independence of our County. America is a great nation, despite what you might see on the news or hear from political commentators. Sure, it’s got its problems, but it is a good place to live. One reason is because we can gather together and worship God the way we want to without fear of the government telling us what to do. America is also great because it is rich! I know not everyone in America has as much money as others, but according to Fortune magazine, America is the 12th richest country per-capita in the world. Considering its large size, this is significant! America is a wealthy nation. One reason for this wealth is because America is thought of as a land of opportunity. America is a place that you can work hard and improve your economic class in your life. Our declaration of Independence says that we all have the rights to Life, Liberty, and the pursuit of Happiness. However, very often in America today, life, liberty, and the pursuit of happiness looks like accumulating money so that we can live the lifestyle that we want to live! Wanting to accumulate money in itself is not always bad, but without consideration and love for God and other people, accumulation can become toxic. After all, how much money is enough? Think about that for a second. Is there an amount of money, that if you had it this very morning, it would be enough, and you would feel like any more is “extra?” The toxic part of accumulation is when there is never an amount of money that is enough. Therefore, toxic accumulators keep accumulating. People who value accumulating money too highly can begin to see life as a zero-sum game where they need to make and hold on to as much money as they can, while other people and organizations including the government and the church try to take as much money as they can from us. It is almost as if accumulators believe that there is only a fixed supply of goods and money, and that they have to fight to hold on to what they have. I spent some time living in New Orleans and my neighbors had developed this toxic mentality about money. They would often tell me that “everyone was grabbin’ for money.” They believed that people asking for money were trying to take away their money to line their own pockets or push their own causes. And on the surface, it seems that the church is not exempt from “grabbing for money.” In fact, on any given Sunday, you can find a special offering to give to that will go to missions or relief work somewhere in the larger church. Followers of Jesus have always been asking the congregation to dig deep into their pockets to support making disciples of Jesus and bringing relief to the poor. But there are three big differences between believers in the Jesus asking for money from a congregation, and other people asking for money. First, unless there is some serious corruption, which has happened from time to time, followers of Jesus are not trying to make a profit. Second, Unlike other non-profits, like Susan G. Komen race for the cure and others, money gathered by believers in Jesus for other parts of the church in the world has the primary goal of making disciples of Jesus Christ. Don’t get me wrong, Curing cancer is a pretty awesome goal. There is nothing wrong with giving money to support that goal. But making disciples of Jesus is a much more important goal! Mainly because even someone who is cured from cancer will eventually die. But those who are disciples of Jesus Christ will live forever, even after death! In today’s scripture reading from 2 Corinthians, Paul is asking the church in Corinth for money to give to the poor church members in Jerusalem. At first it might seem like Paul is grabbing for money from the Corinthians, which were a fairly wealthy congregation. Paul even uses some manipulative techniques to try to get the congregation in Corinth to honor their pledge to give money for the believers in Jerusalem, who were in need of aid at the time. He tried to use flattery on them and to get them to compete in giving with other congregations. But Paul’s motive in collecting money from the congregation in Corinth is to help the congregation to grow closer to Jesus Christ. As a disciple of Jesus Christ, Paul is interested in making new disciples of Christ, but Paul is also interested in teaching the believers to obey all that Christ has taught. And Christ taught a lot about equality between brothers and sisters in Christ. Paul was not simply grabbing for money. I’m not sure that the congregation in Corinth fully understood what Paul was getting at when he talks about believers who have plenty supplying the believers who have need. Paul explains that equality among believers in Jesus is the goal. Let us unpack this idea. This does not mean that everyone needs to be poor. That also does not mean that god wants everyone to be rich. That is not what God is getting at. It is more like the kind of equality that Buddy Pines in the movie the Incredibles is after. The move the Incredibles 2 recently hit the move theaters. How many of you have seen it? How many of you have seen the first Incredibles movie? In the first Incredibles movie, the hero, Mr. Incredible rejects a boy named Buddy Pines as his sidekick because buddy does not have any super powers. Buddy is crushed and feels unloved. Buddy and makes his life mission to invent technology to give everyone superpowers. So then everyone will be equal with the supers. God wants God’s children to be equal, but not equal as in a lowest common denominator kind of way. God wants God’s children to be equally awesome! Equally loved and provided for. Paul is interested in Equality, where everyone has enough. This seems easy enough to understand. Are you all still following me? Here is the real question though, how much is enough? In today’s world how much is enough money for your family for a year? $30,000, $40,000, $50, $60, $70? If you don’t have some idea of how much money is enough, you will always feel like people are trying to grab your money away from you. If this is the case, how can you give money to make disciples with love and cheerfulness. If you always feel like people are grabbing your money that you might need, that can kill cheerfulness in giving. God has given you and I the awesome responsibility of discerning how much money is enough for us. As believers in Jesus, we have the Holy Spirit to help us in this process. Paul reminds the Corinthians about the Manna that God sent while the Hebrews were in the Desert. We read about this in Exodus 16. The one who gathered much didn’t have too much, and the one who gathered little did not have too little. In those days, for the Hebrews, God miraculously showed us equality were everyone had what they needed, no more, and no less. This is how Paul instructs the Corinthians to think about giving to the collection for the church in Jerusalem. This is how God instructs you and I to think about giving to the mission of the church of Jesus Christ today. For us, it all revolves around the question of how much is enough? This is not an easy question to answer, brothers and sisters, but if we wish to excel in this grace of giving it is a question we must answer. Each of us has a different number of how much is enough. Step one is to actually try to figure out what this number actually is. A budget can be helpful here. I know that not everyone is a financial whiz, but having a rough idea is a start. If you struggle with figuring out how much you actually need, and how much is extra, there is help available. I am sure if you step out in faith and trust your pastor or your elders, they can find someone to confidentially help you figure this out. Once you know how much is enough, you will know how generous you can be in giving to the work of the church on the earth, which is to make disciples of Jesus Christ. Once you know how much is enough, you are one step closer to being a cheerful, willing generous giver, which not only makes God happy, but builds up for yourselves eternal treasures in the kingdom of heaven! And that is way better than anything you could buy with your extra money on this earth. That to me is good news.